Reuters recently published an article entitled “If Monterrey Falls, Mexico Falls,” that caused quite a stir. The journalist reported that a factory owner ignored extortion demands by the Zetas (a criminal organization in Mexico dedicated mostly to international illegal drug trade). As a result it was also reported that his plant was sabotaged and his life threatened. He fled to San Antonio, Texas. This was a surprise to many Mexicans. Extortion, it is generally observed, is primarily a border phenomenon that typically affects small retail operations. As far as I know, this story has not been independently verified. The writer also painted the grisly image of a woman who was hanged from a bridge in Monterrey. That’s a fact. The bridge is about 100 yards from my office. But a fact without context is like a sports car without gas. It looks good but doesn’t take you very far. The woman had been shot. The hanging was post mortem. She was also a member of a rival drug gang and apparently a seriously evil individual. Not that anyone deserves to be summarily executed, but you know what they say about living by the sword. This illustrates the problems of reporting on the drug violence in Mexico. There is often a clear disconnect between much of what is reported and the actual experience of those of us who live and work in Mexico. The same article averred that almost everyone living in Monterrey knows someone who, at one time or another, has had to throw himself to the floor at the sound of gun fire. Almost everyone? Monterrey is a metropolitan area of almost 4.5 million residents. Most of us have never heard gunfire, much less seen it. The article has other problems as well. In one paragraph, the author explains that businesses are not investing in Monterrey. A few paragraphs later, the author writes, without feeling the need to recognize the paradox, that millions of dollars are currently being invested in the metropolitan area. Which statement reflects the truth? Perhaps the point is that the economy would be doing even better were it not for the violence. That’s almost certainly true, but by how much? One source says that the violence is shaving one to two percent off of economic growth. Well, is it closer to one or two? The difference is huge. It’s hard to put much stock in an estimate with a range of 100%. The impact of the economic crisis--the worst since the Great Depression it should be remembered—is also downplayed. Every business that has put investment plans on hold. 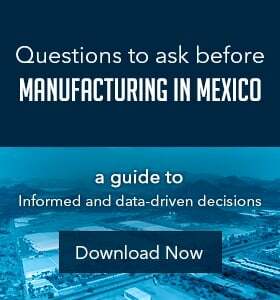 These companies have expressed concerns over the violence in Mexico as one reason for deferring decision making, but have also stated that another reason for this is uncertainty about the strength of the global economy and slack demand for manufactured goods. It’s hard to say which is the principal factor, but my educated guess is that it’s mostly the latter. The reporter did not identify a single company that has decided not to invest in Mexico due to the violence nor did he identify any company that has picked up and moved out of the country as a result of insecurity. If such stories were existent, the reporter certainly would have included them in his piece. That’s not to say there are no problems. The number of homicides has skyrocketed. Still, any given Mexican has about the same chance of dying in a car accident as being a homicide victim in Mexico. if If a Mexican is not in the drug trafficking business, or dedicated to stopping drug trafficking, the chances of him or her being killed are miniscule indeed, especially for those not living in certain “hotspots” such as Juarez, Reynosa and other northern towns and cities. Unfortunately, crime in general has been on the rise. Auto thefts (including car jackings), muggings (including forced ATM withdrawals), and home robberies have gone up significantly in the last few years. How much of this is attributable to organized crime and how much is being carried out by free-lance criminals is hard to pinpoint. Claiming membership in a drug cartel is a good way to establish your bona fides and frighten your victims into submission. The same can be said of kidnapping, which has always been a concern of very wealthy Mexicans but is now a problem invading the upper middle classes. Truth be told, Mexicans are much more concerned about crime in general than the risk of getting caught in a firefight between rival drug gangs. Based on news reports, one might think that Mexico is on the verge of collapse. The funny thing, however, is that it is not. The economy is growing at the rate of over 4.5% annually—a rate the U.S. can only dream of at present—and the peso has strengthened against the dollar. Unemployment has fallen so precipitously that employers, including those in Monterrey, are now reporting some problems finding workers. Hundreds of millions of dollars of foreign direct investment have been pouring into the country. Most recently, Mazda announced plans to build an assembly plant in Guanajuato. Nissan has another big project in the works. Why the tale of two countries? Why are millions of dollars of what appears to be smart money flowing into Mexico? It’s difficult to say for sure. But it probably has to do with the ability of sophisticated investors to separate hyperbole from reality and to assess the crime situation in terms of genuine business risk. Large manufacturing operations have been relatively unaffected by what is reported in the news. The fact that cartel members are killing each other in record numbers is of little concern to a manufacturer, even those located in the so-called hot spots. And most of Mexico (it’s a very big country) is virtually unaffected by the violence. Even cargo theft is an issue primarily for companies dealing in readily saleable consumer goods such as food, clothing, and electronics. There’s not much interest in stealing aerospace components that can’t be easily fenced. Besides, cargo theft is an insidious problem even in the U.S. While there is concern that senior executives may be kidnapping victims, so far this has been a manageable risk. And these senior executives are almost always Mexicans. There is a large pool of qualified engineers and MBA’s available to manage operations in Mexico while foreign management flies in every month or two and then heads home. Chicago is closer to Monterrey than to Los Angeles, and it’s in the same time zone. U.S.-based executives who periodically fly in and out of Mexico are at virtually no risk of being crime or kidnapping victims. This is not to minimize the plight of Mexican managers and executives who live here. Needless to say, while they welcome the availability of high-paying job opportunities, they have a strong incentive to do whatever is necessary to deal with the problems currently plaguing Mexico. And they are. Sophisticated investors see the efforts by government and the private sector to deal with crime and the drug gangs. Despite all the disruption and negative press, President Calderon enjoys an approval rating of over 50%. There are initiatives to clean out and professionalize the notoriously corrupt local police forces so that the military doesn’t have to do all the heavy lifting. And there are effective local initiatives such as the Center for Citizen Involvement (Centro de Integracion Ciudadana) in Monterrey. Funded by major Mexican corporations, the CIC works together with government authorities to gather and report reliable information concerning criminal activity and to serve as an initial point of contact and subsequently as a liaison for crime victims who are often leery of working with government officials. This allows undermanned and underfunded government agencies to dedicate fewer resources to information gathering and focus on investigation and apprehension. Mexican institutions are still well down on the learning curve. But the situation is improving week to week and there have been several high-level arrests and successful kidnap rescue operations in recent months.